North Walsham is a large parish situated in northeast Norfolk. Walsham comes from the Old English for ‘Wael’s homestead’. People have lived in the area for a long time, and the parish was certainly well established by the time of the Norman Conquest, its population, land ownership and productive resources being detailed in the Domesday Book of 1086. Also mentioned in this document is a water mill, which in all probability stood on the same site as Ebridge Mill (NHER 11730). The earliest dateable evidence of human activity comes in the form of a single Palaeolithic flint blade (NHER 41835) found to the southwest of the town in 2005. Mesolithic flint finds include an adze (NHER 17512), an axe (NHER 34681) and a blade (NHER 37631). The Neolithic may have left traces of the earliest features to be discovered; excavations during pipe laying works in 2004 revealed Neolithic or Iron Age pits (NHER 37631). Neolithic finds include pottery fragments found in these pits, a polished flint chisel (NHER 6833), chipped axeheads (NHER 6835, 6836 and 6837), polished axeheads (NHER 8177 and 14933), scrapers (NHER 33591) and blades (NHER 37631). The only Bronze Age finds to date are a flint knife (NHER 6832) and a very corroded copper alloy axehead (NHER 12631). However, aerial photography has tentatively identified several ring ditches (for example NHER 11839, 12821 and 14755), possibly the flattened remains of circular burial mounds of the period. The Neolithic pits found at NHER 37631 could also be Iron Age in date, and had pieces of pottery from the time in them. The only other Iron Age find to date is a curious one, an Egyptian coin (NHER 6838) dating to about 275 BC that was dug up in about 1949. There is currently no evidence of any Roman structural remains, but quite a number of Roman objects have been recovered. These include pottery fragments (for example NHER 6839, 19759 and 21843), coins (for example NHER 6840, 18375, 22050 and 39987), a gold ring (NHER 14301), a brooch (NHER 44052), a bracelet (NHER 44053) and a figurine of a dog (NHER 34682). A medieval inscribed seal set with a decorated Roman gem was found in the mid 19th century (NHER 23728). Saxon finds include a coin (NHER 6841), a terminal (NHER 32284), a stirrup strap mount (NHER 33633) and a buckle and thimble (NHER 44053). A brooch found at NHER 40666 may be Late Saxon or medieval. The medieval period has left the parish with its oldest surviving building, St Nicholas’ Church (NHER 4788). Set just off the Market Place, this is a grand town church, packed with much of interest. The building is dominated by the ruins of its 14th or 15th century west tower, once one of the tallest in Norfolk, which collapsed in 1724 and again in 1836. It has never been rebuilt, though a modern vestry squats in the base. To the north of the tower are the remains of an earlier tower, possibly pre-Conquest. The body of the church is mainly 14th and 15th century, later subjected to an enthusiastic Victorian restoration. The south porch is a late 14th century showpiece, luxuriously carved, decorated and pinnacled, with figure niches and the arms of Edward III and his son John of Gaunt. Inside the porch, the roof beams have fine original (though restored) bosses. Inside, the church is one vast hall, the feeling of space hardly interrupted by seven-bay arcades of clustered columns and pointed arches, with light pouring in from the aisle windows with their simple tracery. The east windows are Victorian and later replacements. There are many internal features, memorials and brasses of interest, too many to mention here, but a few examples may whet the appetite. A particularly fine 15th century font cover, much restored, hangs from its original beam. Over the tower door is a rarity, a Royal Arms with Charles II on one side and the Commonwealth Arms on the other. Parts of a 14th century painted screen survive. The communion table in the south chapel is mid 16th century. Of all the internal monuments, the most ornate is surely the tomb to Sir William Paston (who died in 1608), founder of the local grammar school. This is an excellent standing alabaster monument, which shows Sir William reposing full length in armour, comfortably propped up on his elbow. A meticulous man, he commissioned this extravaganza himself two years before he died. The medieval period saw a considerable commercial expansion in the area, with North Walsham the village growing into North Walsham the town after the arrival of Flemish weavers in the 14th century. By 1379 sixty eight families were engaged in making Walsham cloth (lighter than that made at Worstead), while only thirty families were occupied in agriculture. The town was also a local centre of the Peasants’ Revolt in 1381 and the final Norfolk battle took place to the southwest on 22 June, (NHER 7567) where Bishop Spencer crushed the rebels led by Litester. The site is now a cultivated field on the edge of woodland. The remains of two medieval stone crosses (NHER 7568 and 7569) are said to mark or commemorate the battle, although NHER 7569 has since been moved and used as a parish boundary marker. Further north, on the edge of town, is Stump Cross (NHER 7566), the remains of a 14th century standing stone cross, consisting of the base and the lower part of the original shaft. A plaque nearby states that by tradition it dates from and marks the site the battle, but it is more likely to have been a wayside cross to which this legend was later applied. Quite a number of medieval objects have been recovered, including coins (for example NHER 33591, 34268, 36174 and 39306), pottery fragments (for example NHER 6843, 7570, 21843 and 22049), a collection of whole pottery jars (NHER 6842), a decorated lead weight (NHER 24928), buckles (NHER 40665), jettons (NHER 30077), horse harness pendants (NHER 31840, 36616 and 40475) and a coin reused as a brooch (NHER 34964). Other medieval buildings have not survived, but sometimes traces of them can be seen incorporated into later constructions. For example, Bexley Cottages (NHER 17622) on Station Road is a 19th century terrace of flint and brick houses containing a large amount of re-used medieval stone. The start of the post medieval period in the town was marked by a disastrous fire in 1600, which destroyed 118 houses in the town and, it was claimed, cost £20,000. As a result, the majority of buildings date from after this time. At the last count there were ninety two post medieval buildings of historical or architectural interest in the parish, way too many to mention individually. The vast majority are concentrated in the centre of the town, in the Market Place and the streets that run from it. For the purposes of this summary just a few selected examples from an imaginary circuit of the town centre will be given, but for further information the detailed records should be consulted. On Church Street to the east of the church is a series of early 19th century brick houses and shops. The White Swan (NHER 47387) at number 12 is an 18th century and later two storey grey-washed brick public house with a pantiled roof. It has a central panelled door with a hanging sign at first floor level above it. Number 14 (NHER 4787) is a late 17th to early 18th century house, now a butcher's shop, with shaped gables and dormer windows. Turning into Vicarage Street, Number 38 (NHER 46599) is an early 19th century two storey red brick house with a pilastered shop window. Formerly part of the Vicarage, Number 56 (NHER 46697) is an 18th century and later five storey limewashed brick house with a pantile roof. At the west end of the street, near the junction with Mundesley Road are the former Church Rooms (NHER 47599), a brick building of 1826, partly rendered with a pantiled roof. It was built initially as Fisher's Theatre and had two tiers of seating boxes on three sides. It was altered in the late19th century, and is currently used as a showroom. Left out onto Mundesley Road and on the corner with Cromer Road is Kett’s House (NHER 1081), opened out inside as a restaurant but still with an early 17th century timber frame. It has sunken bridging beams on the ground floor and a shop display on the corner, a thatched roof and a central chimney stack. Further on in Aylsham Road is Ivy Cottage (NHER 4786) at Number 15, a 17th century brick cottage with two pilastered doorways either side of a smaller door, all blocked in 1806, when the other side of the building was converted to the main frontage. One end of the house is three storeys high, the other, which was a granary, two storeys with probable bread ovens in an undercroft. Some of the beams in the house are said to have come from an earlier building. Aylsham House at number 14 (NHER 4785) is a good example of a Georgian red brick house with a fanlight porch. Turning back towards the centre of town, past Kett’s house and into Market Street, on the right is the Old Girls’ School (NHER 4784), an early 19th century two storey grey brick house with a Greek Doric porch that is now part of Paston College. Further up is the Feathers Inn (NHER 47391), an early 17th century brick pub, two storeys high with attics and three dormer windows under a pantile roof. The Doric doorway has fluted pilasters. From here up to the Market Place and probably the town’s most famous landmark, the Market Cross (NHER 4783). The first market cross put up in 1550 burnt down in the fire of 1600, but its replacement is memorable, even if much restored, and dominates its surroundings. It is an octagonal timber structure with an open ground floor under a three-tiered dome. The clock face in the upper dome was taken from Worstead Hall in 1787. The rest of the Market Place is lined with three storey early to mid 19th century houses and shops, with narrow passages darting off to the north and south. At the east end, the early 17th century Cross Keys Hotel (NHER 1131) has been gutted to make a supermarket, but the quadruple octagonal flues to the chimney stack have survived. Out of the Market Place and into New Road, on the left are Council offices (NHER 47784), a late 18th century two storey mainly rendered building with a slate roof and mid 19th century alterations and additions, including a grey brick wing on the right. Turning right, past the 1966 Post Office and the Lidl supermarket, then right again takes you into Grammar School Road, and down here on the right is Paston College (NHER 47791), originally founded in 1606 as the Paston Free School by Sir William Paston in 1606. The present building stands on the site of the original and dates to 1766. It consists of a three storey seven window bay red brick range with a hipped pantile roof. Horatio Nelson was a pupil here from 1768 to 1771. Right again at the bottom of this road and into King’s Arms street with the Tumbler Wheel (NHER 46598) on the left. Down here is Number 22 (NHER 4782), a 17th century and later cottage with shaped gables, the moulded platband hacked away on the right for a shop front. The Church of the Sacred Heart (NHER 39329) is a mid 1930s red brick church in Scandinavian Art Deco style. It consists of an aisled nave, chancel and a southwest porch-tower. Further down on the right is the King’s Arms Hotel (NHER 32932), a 17th century and later brick and flint building, partly three storeys high and partly two storeys with attics. It has Dutch gables to the rear, an altered shop front on the corner and a wooden pilastered doorway. The north front facing the Market Cross is 19th century. Further afield, to the south of the town on the Norwich Road is Monument Cottage (NHER 12019), a late 18th century brick toll house built for the Norwich Turnpike. The River Ant, running through the east of the parish, has always played a part in its history, particularly after parts of it were modified to form the North Walsham and Dilham Canal (NHER 13534). This important artificial waterway linked North Walsham to the River Ant at Dilham. The idea to build it seems to have originated as a means of avoiding the fairly high cost of transporting goods on the newly opened toll road between North Walsham and Norwich. It was also seen as an opportunity to improve turnover at a number of water mills along the river, including Ebridge Mill (NHER 11730) and Bacton Wood Mill (NHER 11572). Although the idea to build a canal was decided on, mainly by local landowners, in 1811, and an Act of Parliament authorizing its construction was passed in 1812, the canal was only completed in mid-1826 at a cost of £32,000. Once completed, the system allowed goods to travel from Antingham, via the River Bure, to Great Yarmouth (and of course back). The canal was ten miles long, dug by hand by a labour force of about a hundred men, and lined with clay. 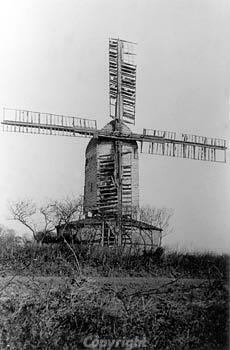 A special cut ('Tyler's Cut') was made in Dilham to access a brickworks there (NHER 15890). However, the canal itself was narrow, only able to take boats up to twelve tons, and it soon became clear that the volume of trade was too small to be profitable. Even if the volume had been higher, the water supply (from the upper reaches of the River Ant) would not have been sufficient to replace the water let through the locks. Also the advent of the railways (the Midland and Great Northern, NHER 13581 and the Norfolk and Suffolk Railway, NHER 13585) and improved roads meant that, in a short period of time, cheaper and more efficient transport systems were available. Some post medieval structures that once stood in the parish and are marked on old maps have not survived. These include, amongst other things, brickworks (NHER 6856 and 15850), windmills (NHER 6858, 13282 and 15851), a workhouse (NHER 15426), a bone mill (NHER 15853), a gibbet (NHER 13281) and a lime kiln (NHER 15852). The river and canal were also to play an important role in both World Wars, being incorporated into a series of anti-invasion defence stop lines along which pillboxes and other reinforced structures were built at tactical strong-points. These defences were quite sparse in World War One, but on a massive scale across the east coast in World War Two. Most were cleared away after the conflicts ended, but some are still there today. Four World War One pillboxes (NHER 16447, 16788, 24107 and 28843), rare survivals, are still to be seen, as are World War Two pillboxes (NHER 16789, 32551, 32553, 32555 and 32560) and two Home Guard Posts (NHER 32252 and 32622). After World War Two, a memorial park (NHER 33511) was opened, containing a beech-hedged ornamental enclosure with a cherry tree lined walk down to the town's war memorial. The park was once part of a very large estate which had a Great House (The Oaks), pleasure gardens, orchards, plantations, a hot house and an orangery. The Oaks was demolished in the 1930s and its site is now occupied by the town library, new housing and some commercial developments. Piet Aldridge (NLA), 30 November 2006.